The all-new 2014 Chevy SS performance sedan is the first vehicle in seventeen years with rear-wheel drive. This car will be Chevy’s entry in the 2013 NASCAR Sprint Cup Series. Similar to the 2014 Corvette Stingray and Camaro, this car delivers speed while maintaining a comfortable cabin and modern convenience. The new SS is race-tested and was built with a performance vehicle foundation. The small sedan can deliver upto 415 HP and 415 pounds of torque. 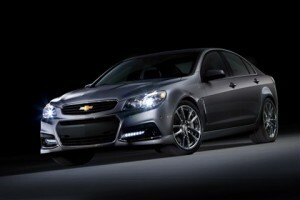 Additionally, the Chevy SS can hit from 0 to 60 in about 5 seconds. “The SS’s body structure is so rigid that it allows the suspension to do the job that it was intended to do and make the car responsive and confident when it matters. This along with its impressively stout brakes, helps the SS feel like it’s built for shaking off pricey luxury sedans” said Jim Crivelli, a Chevrolet dealer principal.